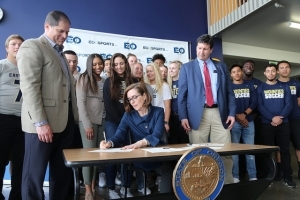 LA GRANDE, Oregon — Eastern Oregon University in La Grande is getting a new field house as part of $80 million dollars being spent on higher education by the legislature. The university is celebrating $9 million from the state for the field house. President Tom Insko says it will allow the school to bring wrestling back, host other sports and create a new space for their physical activity and health lab. Governor Kate Brown attended the ceremony and says the project will use cross laminated timber. A new product designed in Oregon that can be used in construction of houses and large buildings. CLT will be used in the project at Eastern along with projects at OSU Cascades and the University of Oregon.